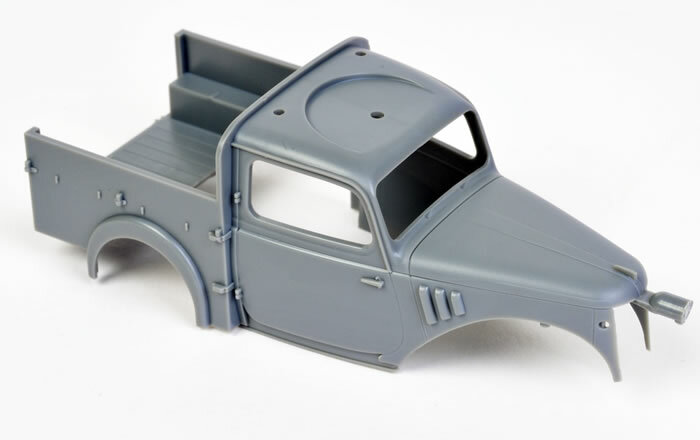 Advantages: Simple parts breakdown but nicely detailed; optional closed or rolled rear flap for canvas tarpaulin; clear parts include headlights and small front fender lights; separate cargo door may be posed open; very versatile usage for military or aircraft modellers. The WWII British class of 4x2 Light Utility Cars was used widely by the British Army in virtually every theatre, and by the Royal Air Force at home and overseas. There were four companies manufacturing these Light Utility Cars - Austin, Standard, Morris and Hillman. Each was a different design. As a family, the Light Utility Cars were more commonly known as the Tilly. More than 65,000 Tillys were manufactured during WWII. Although this might seem a small number if compared to the 647,000 Jeeps produced in the same period, it was nevertheless an iconic British wartime vehicle. 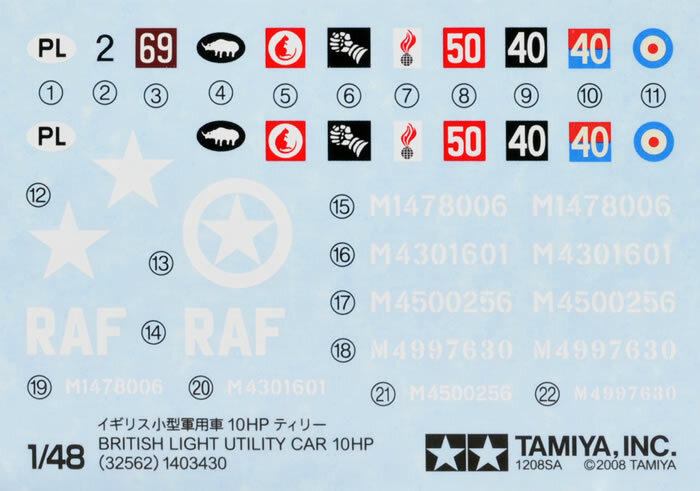 Tamiya's coy labeling is presumably as a result of brand trademark complications, but just between you and me this kit represents the Austin Tilly. Around 30,000 of this variant alone were delivered during the Second World War. A few years ago, Accurate Armour released a lovely resin 1/48 scale Standard Tilly, but it should be noted that Tamiya's kit is the first time that we had an Austin Tilly available in this scale. 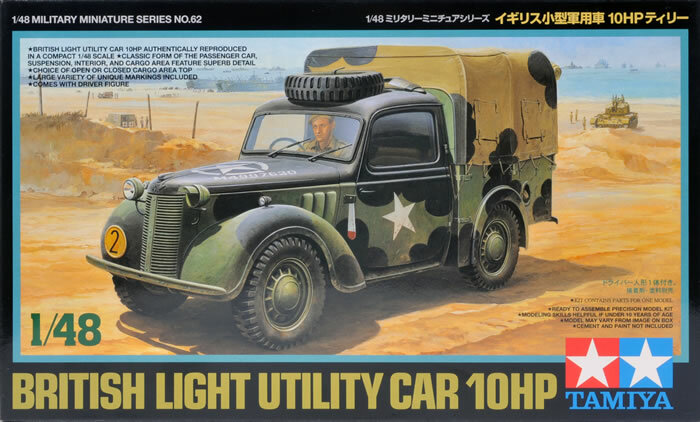 Tamiya's 1/48 scale British Light Utility Car 10HP comprises 38 parts in grey plastic, nine parts in clear and markings for four vehicles. As you might expect, moulding quality is perfect. The grey plastic parts include the body in one piece, which includes cabin doors and the bonnet moulded shut. Construction looks like it will be supremely simple. 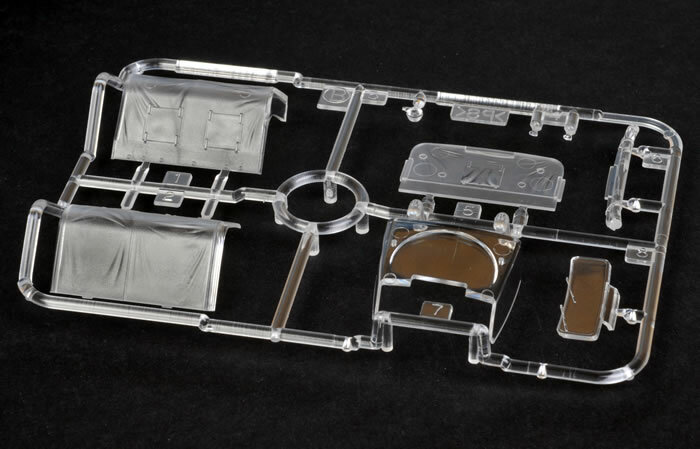 Clear parts include a single moulding for the closed side windows that is glued to the ceiling of the cab. The clear windscreen is a separate piece, so if you want to display the side windows wound down, you can just omit the clear part B7. The canvas cover is moulded in two halves of clear plastic. This is curious, as the canvas flaps covering the small flexible windows in the side and the rear of the cover are moulded closed, so there is no way to benefit from the clear plastic (unless you want a see-through effect for the contents of the tray - "The Visible Tilly" perhaps). A nice touch for the cover is the optional rear access flap. Alternate parts are supplied for a closed flap, or rolled into the open position. The rear cargo door is also a separate part that may be posed closed or open. Other details include the spare tyre stowed on the roof, transparent headlight and small front fender lights, and a petite two-part petrol cap. Markings are provided for four Army and one RAF vehicles. One of the Army options wears the Black and Green "Mickey Mouse" camouflage, while the RAF vehicle is finished in a fetching shade of blue. Tamiya's 1/48 scale Austin Tilly is a nicely detailed model that will be fast and easy to build. It will find favour with both military and aircraft modellers as a standalone item, or as part of a diorama.